Former MetroStars assistant coach Fernando Clavijo passed away today after a battle with multiple myeloma. 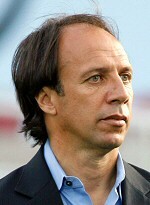 Clavijo played for the US in the 1994 World Cup and assisted Bora Milutinovic during the ill-fated 1999 season. Tributes to Clavijo mention his tenure in charge of New England and Colorado, but glance over his first head coaching gig: after Milutinovic's firing, he was briefly in charge of the MetroStars late in 1999. The hiring of Octavio Zambrano put an end to the spell; Clavijo never actually coached a game. Clavijo was 63 years old.